The half term Halloween holidays are covered at London’s South Bank with four fabulous attractions all offering a spooktacular range of events. This October Half Term, families visiting London’s South Bank are in for a spellbinding Halloween adventure. 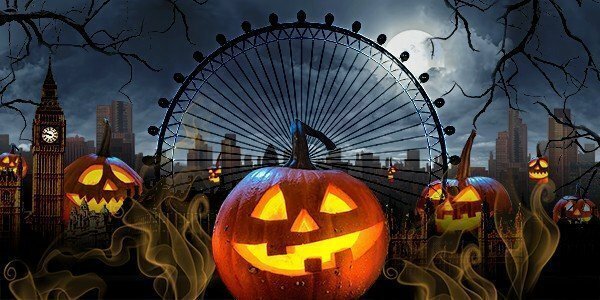 Whether it’s the ‘Slice of Pumpkin Eye’ activity trail at the Coca-Cola London Eye, getting a dose of scary fun at the true “Home of Halloween” at the London Dungeon, or having a wickedly witchy time with the Spooky Seas being brought to life at SEA LIFE London Aquarium, there’s something for everyone. For those who fancy something completely different, enjoy a bright and beautiful trip to Far Far Away and meet Poppy and Branch from DreamWorks Animation’s latest release, Trolls, at Shrek’s Adventure! London. Merlin Entertainments is bringing all the aspects of Halloween fun to life in the heart of the capital. With something for everyone – families, teens, couples and first-time visitors to London will be able to explore the South Bank for a range of tricks, treats, and spookiness to celebrate the season. Squashing everything “Pumpkin” into the Coca-Cola London Eye, families will be able to pick up a fun Halloween pumpkin activity pack, where kids can hunt for letters spelling out PUMPKIN from the amazing London landmarks seen from the Eye. As well as learning Halloween-tastic facts about London, families will be able to carry on the Halloween adventure when they get home by carving some London Eye themed pumpkins with templates provided in their packs. They will then be able to post pictures of their creations on social media to enter our “gourd-geous” competition. The event will run from 22 to 31 October. The London Dungeon (situated next to the Coca-Cola London Eye) is for the month of October home to a dark coven of witches, with three witch-related scary shows. Chilling witch hunts, curses and accusation – the fingers could be pointed at anyone…so guests should take heed! Guests brave enough to join the witch hunt will come face-to-face with the seventeenth century Matthew Hopkins, known as the Witchfinder General. Those who do managed to escape from the clutches of the evil Hopkins will have plenty more tricks…and wicked treats in store as the London Dungeon unleashes 1000 years of London’s dark history in 19 shows, featuring some of history’s greatest rogues and villains, two thrilling rides and plenty of edge-of-the-seat surprises. This ‘Hallow-marine’ guests will have a chance to witness a daily dive while spotting some of the scariest creatures in the ocean. Visitors can keep their eyes peeled for ‘spooky sea’ clues around the attraction revealing where some of the strangest bogey-fish lurk! Each day of the Halloween Half Term, a different spooky character will dive into the largest tanks whilst getting up close and personal with our range of marine creatures from our Sand Tiger Shark to Green Sea Turtles. Daily dives will take place between 11am and 2pm. See our experienced staff. And on Halloween day itself (31st October), the Fish Witch will be making a special appearance. This scaly, green marine crone only comes out on Halloween to cook up a cauldron full of spooky fun for visitors! For those feeling particularly brave, there is also the exclusive ‘Sharks in the Dark’ snorkelling experience offering would-be divers the chance to come face-to-fin with over 15 magnificent sharks, after hours. The evening experience – with limited slots offered between 27th – 31st October ONLY – will see participants submerged beneath the water in a mesh divers’ net, equipped with explorer-style red light torches to spot six species of shark in the eerie darkness. Those who want to brush off the Halloween cobwebs and find their happy place can head to Shrek’s Adventure! London. Sing, dance and have lots of fun as the wild-haired stars of DreamWorks Animation’s Trolls will be taking over Shrek’s Adventure! London. From 22 October, guests will be able to meet Poppy and Branch and step into the vibrant world of Trolls Village exclusively at DreamWorks Tours Shrek’s Adventure! London. Think rainbow colours, feel-good songs and plenty of celebrations. With characters voiced by the likes of Justin Timberlake (Branch) and Anna Kendrick (Poppy) the film is brought to you by DreamWorks Studios, creators of other legendary hit film franchises such as Shrek, Madagascar, Kung Fu Panda. The coiffured co-stars will be joining Shrek at the end of the adventure to meet guests, take pictures and share the unbeatable fun. Are you visiting the London’s South Bank this Halloween?